I can’t count the number of times I have been browsing through a magazine or online and encountered what looks like a magical and fun excursion not too far away from my home in Canada. I’ll think about how awesome and fun it looks and then keep browsing along somehow knowing we will never get around to actually taking that adventure. With so many places to explore in the world, why bother with the ones close to home? A couple of years ago we encountered La Domaine de la Forêt Perdue exactly like that - something stumbled upon randomly, but not easily forgotten about. La Domaine is an ice skating trail near Trois-Rivières, Quebec. With over 15KM of masterfully groomed trails, you do genuinely feel like you are getting lost in an enchanted forest. The path will often split in two with no indication as to where one option might lead. So you go with your gut, pick a direction at random and see where it takes you. We were lucky enough to be there on a fairly snowy day. Thick snowfalls have this magical effect of muting all of the noise around you, making the world seem quiet and far away. The only sounds were our skate blades slicing through the ice and the snow falling on the pine trees. This trip was a good reminder that sometimes the best adventures you can have aren’t that far away to find. By creating and following diets, humans not only eat to stay alive, but they fit themselves into a cultural edifice that is larger, and more permanent, than their bodies. It is a sort of immortality ritual, and rituals must be performed socially. Clean eating rarely, if ever, occurs in secret. If you haven’t evangelized about it, joined a movement around it, or been praised publicly for it, have you truly cleansed? This is why arguments about diet get so vicious, so quickly. You are not merely disputing facts, you are pitting your wild gamble to avoid death against someone else’s. You are poking at their life raft. But if their diet proves to be the One True Diet, yours must not be. If they are right, you are wrong. This is why diet culture seems so religious. People adhere to a dietary faith in the hope they will be saved. That if they’re good enough, pure enough in their eating, they can keep illness and mortality at bay. Almost exactly two years ago I signed up for Renaissance Periodization (RP). The short version of the story of why I decided to do RP is that my weight had slowly been creeping up over the years and despite being an active person it felt like nothing I had tried before was really changing that. I was feeling frustrated and knew I needed a different approach. In short, RP offers diet templates and coaching, as well as other services for people looking to change how they eat. Quick glossary: macronutrients or macros are the compounds that make up all of the food we consume - so carbs, protein and fat. "Cutting" or a "cut" is basically means dieting/limiting the overall amount of food you are eating to help loose weight. I first learned about RP through seeing people's transformation pictures posted on Instagram. I spent a few months reading about it and debating when would be the "best" time for me to try doing my first 12 week cut. After feeling particularly down on myself one day, I finally bit the bullet and signed up - despite the fact that I knew I'd be attempting to cut weight during the holiday party season. The general advice is to not attempt cutting during holidays, any periods of time you will be traveling or experiencing any major change in your life. Well, I had to deal with all of those during my first cut and I survived just fine. Ultimately, the only thing I regretted was not doing it sooner. This experience really drove home the idea that if there is something you want to change in your life, the only thing holding you back - is you. If you really want to loose weight and change your body composition, there are no easy quick fixes. Tea detox? Green smoothie cleanse? Nope, think again. You might get some quick wins following those sort of protocols, maybe a few less pounds on the scale - but you will gain that weight back again once you start eating solid foods once more. When I started RP, it actually felt like I was eating MORE than I had been before. I was eating 4-5 smaller meals per day, all featuring protein, carbs and fats. But to make all of those meals? Wow, that took work. Prior to doing RP I did usually spend a chunk of time on Sundays meal prepping, but doing RP took that to a whole new level. The volume of food I had to organize, prepare, and label (yup) was unreal. I actually cried the very first Sunday night I tried to do it all because it was so overwhelming. When I started RP I had a very busy lifestyle. I worked a 9-5 job and would wake up early to go to the gym and often wouldn't get home until 9-10pm at night because I'd ride my horse after work. I started waking up at 530AM on Thursdays to cook extra chicken breast to have enough food for the rest of the week and the weekend. Is waking up that early to cook my idea of a good time? HECK no. But it was what I needed to do if I wanted results. I have come to really appreciate the fact that the audacity of the goals you have and results that you want are directly in proportion to the amount of effort you need to put in. This is a lesson that extends well beyond dieting, lifting and fitness. Prior to RP my typical breakfast was a green smoothie loaded with things like mango, pineapple and coconut water. I'd sometimes put a bit of protein powder or hemp seeds, but not always. I'd almost always be quite hungry before lunch, especially if I worked out in the early AM. I learned that my usual breakfast was actually really quite high in carbs and lacking good protein. My typical breakfast now is almost always egg whites with a bit of cheese, some spinach (or some other greens) and either brown rice or berries - depending on what I want that day. I genuinely was not much of an egg person before doing RP so it took some work to get over that. I use egg whites now mostly because I am not a big fan of yolks. But I actually never get tired of this breakfast and it is a much better, more complete meal than what I was eating before. Even now, when I am not strictly measuring my macros, I always think about protein first in my meals or snacks. If I want to eat something quick, like an apple, I always make sure to consume some protein or even fat at the same time. RP really changed the way I think about the food I consume and shifted my thinking from just grabbing whatever was nearby/convenient/looks yummy in the moment to gaining a deeper appreciation for what our bodies need for fuel to have sustained energy and build muscle. After my first cut I was definitely worried about maintenance and putting weight back on. Most people's typical experience with dieting includes following some kind of "fad" diet for a set amount of time and then putting that weight back on - or more - once they stop following the strict guidelines. But like I mentioned above, RP really shifted my mindset around food in general. The problem with some of the more extreme fad diets is that they usually are very hard for people to stick to in any long-term fashion - especially if you have a social life. I never had to 100% cut out carbs when I was cutting and maintenance just meant I got to eat more of the healthy foods I was already consuming anyway. Least anyone think that I am completely perfect in my diet and eating now, I will quickly dispel that myth. I have had nachos twice this week and just had a handful of potato chips before sitting down to write this. I love food and enjoy cooking. The difference is that the vast majority of the time I focus on getting enough protein, eating lots of vegetables and healthy fats while sticking to carbs like brown rice, sweet potatoes and fruits. If I go away on holiday for a couple weeks and come back with a few extra pounds, that no longer worries me because I have exactly the toolsets and knowledge that I need to get myself back on track to my range that I try to stick to in maintenance. In addition to changing the way I eat, I also started getting in to weight lifting at this time. Remember, my goal was specifically to build lean muscle mass and - of course - lifting was (and still is) key for me to achieve that. While I had always been active before RP, weight lifting was foreign to me. I much preferred cardio stuff, like spin classes and boxing classes. While I still do those from time to time, lifting played a huge role in my transformation. I also ended up really falling in love with it and have enjoyed the process of learning and hitting new personal bests along the way. I also no longer see food as a reward for working out but rather something that I can choose to fuel my workouts to help me perform at my best. Recently went to Newfoundland for a hiking trip. 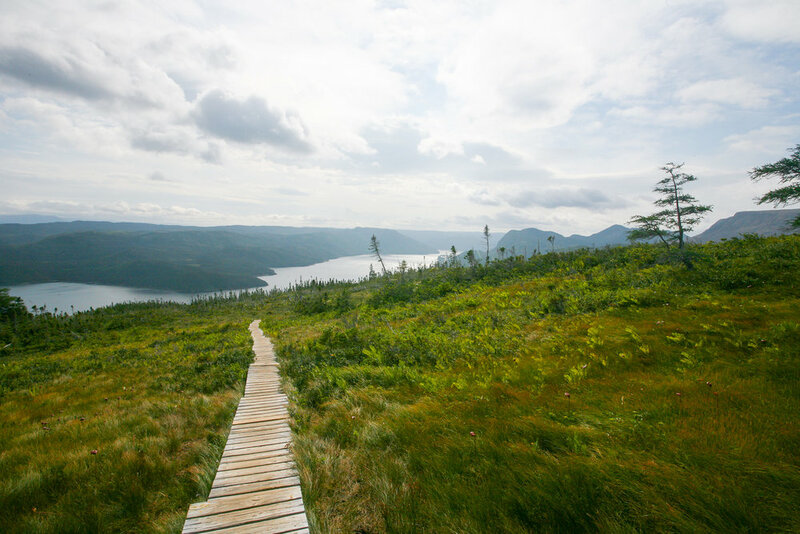 The vistas were unreal - the photo below is from the top of a hike in Gros Morne national park. The park was totally accessible, easy to get around with well-documented and marked hikes. Definitely would recommend it to anyone wanting a unique trip, whether you are from Canada or not! I recently decided to get my Precision Nutrition Level 1 certificate. My primary motivation was just deepening my own understanding of nutrition science, and perhaps learning some information and skills that could help family and friends. It is a confusing world out there when it comes to nutrition, and we are constantly surrounded by conflicting information. Low carb diets will kill you! Fat is good for you! It can be a challenge for even the most well-informed to know what to believe. Another motivation for pursuing this certificate was that maybe, finally I would come to learn - once and for all - what exactly is the perfect diet. What is the best way to eat for health? For maintaining or developing fitness? For helping with the prevention of disease and weight gain? I thought perhaps taking this course would help find that answer. So imagine my surprise when in some of the very first readings I had to finished I learned that PN doesn’t actually fall in to one specific diet pigeon hole! In fact, the typical thinking in PN is that there is no such thing as one perfect “diet” that is going to fit every individual and every scenario. And I get it - thousands of people all around the world sign up for this program. They come from a huge range of backgrounds. And the people these future coaches will go on to help will come from just a diverse range of situations too. Different socioeconomic backgrounds, different schedules, different food intolerances and allergies. Different goals and perhaps even differences in how readily they can access certain kinds of nutrients. PN also states that most good, healthy diets look more similar than not and all have the same founding principles such as eating whole foods and getting a good amount of vegetables. Fundamentally, all of these different diets are about having an awareness of what you are putting into your body on a regular basis. So once you scratch the surface, these trendy diets might have more in common than you realize at first. I have always loved a good foggy day and it felt particular atmospheric at the cottage last weekend. Was like being in a Stephen King novel.